Zion Market Research has published a new report titled “Telecom Power System Market by Component (Rectifiers, Converters, Controllers, Heat Management System, Generators, Circuit Breakers, Distribution Unit, Protection Devices, and Others), by Grid(On-Grid, Off-Grid, and Bad Grid), and by Power Source (Diesel-Battery, Diesel-Solar, Diesel-Wind, and Multiple Sources): Global Industry Perspective, Comprehensive Analysis, and Forecast, 2017-2024’’. 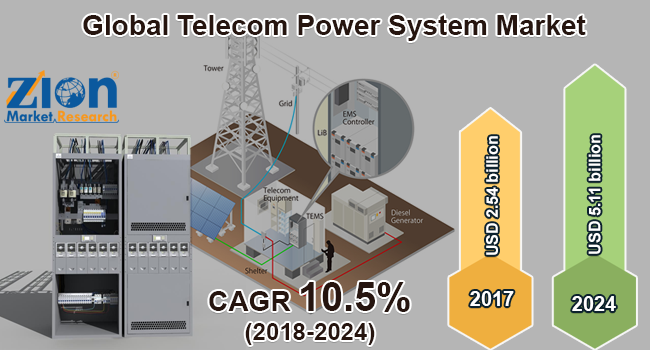 According to the report, global telecom power system market was valued at around USD 2.54 billion in 2017 and is expected to reach approximately USD 5.11 billion by 2024, with a CAGR of 10.5% between 2018 and 2024. Telecom power system is the power system network designed especially for internet backbone, wireless broadband access, datacenters, and fixed-line applications. Telecom power systems are efficient to store energy on batteries when AC supply is absent. It is uninterruptable and filters the noise from the main supply. Growing adoption of the hybrid power system is driving the telecom power system market growth. Additionally, expansion in telecom infrastructure is driving the demand for new telecom power system networks and towers, thereby propelling the market growth. Moreover, rising demand for uninterruptable telecom service is projected to drive the market growth in the forecast period. However, environmental concern related to growing carbon imprints by the power system networks restricts the market growth. Telecom power system market is segmented on the basis of the component, power source, grid, and region. The component segment is classified into rectifiers, converters, controllers, heat management system, generators, circuit breakers, a distribution unit, protection devices, and others. Distribution unit held the largest telecom market share in 2017. On-grid, off-grid, and bad grid are the distribution of the grid segment of telecom power system market. Presently, bad-grid is holding the largest market share and off-grid is anticipated to witness the fastest CAGR in the forecast period. On the basis of the power source, the telecom power system market has been segmented into diesel-battery, diesel-solar, diesel-wind, and multiple sources. A diesel-solar segment of the power source is projected to grow at a rapid pace in the forecast period. High demand for renewable energy source coupled with low operating costs of the system is the major factor contributing towards the growth of diesel-solar. Diesel-battery sub-segment accounted for the largest market share in 2017. Diesel-wind sub-segment is also anticipated to grow at a significant CAGR in the forecast period following the diesel-solar sub-segment. Wind energy requires large capital investment and the output is comparatively lower than solar energy that is impacting the diesel-wind market share. By geography, Asia Pacific is leading the telecom power system market and is anticipated to dominate the forecast period as well. China dominates the Asian region, owing to the high population growth rate supported by a large number of mobile users. Introduction of 4G LTE connection has a wide scope for developing countries to establish their strong presence in the Asia Pacific market. Europe has an attractive share in the market due to the strong presence of automobile industries. Telecom tower companies in North America have introduced picocells and femtocells that have compressed the size of the power system and reduce the installation, logistics, and procurement cost. North America telecom power system market has witnessed a shift towards hybrid power solutions that will enhance the profit margin for the operators or service providers. Significant players for telecom power system market are Delta Electronics, Cummins Power, Eaton, GE Industrial Solutions, Microtek International Inc., Huawei Technologies Co., Schneider Electric, Vertiv Co., Myers Power Products Inc., AEG Power Solution B.V., Mitsubishi Electric Corporation, Ascot Industrial S.R.L., and Unipower among others.